The Roundhay estate was purchased by Leeds City Council in 1872 and landscaped by Thomas Nicholson, it opened as a public park on the 19th of September later that year. At the time, the then Lord Mayor John Barran was ridiculed for buying a 'White Elephant'. It was seen as a reckless waste of taxpayers money as many believed that the park was too far out of the city for the majority of the population to enjoy. 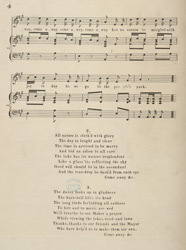 This song celebrates the opening of the park as it created jobs for the labourers and gave everyone the opportunity to enjoy the beautiful landscape and fresh air.